Our sweet baby boy, August Daniel, was born early in the morning on January 6th! I have been wanting to get a post up with some of the hundreds of photos I've taken in the past month. This is going to have to be "part one" of two or three, because I haven't sifted through the ones from the hospital yet. 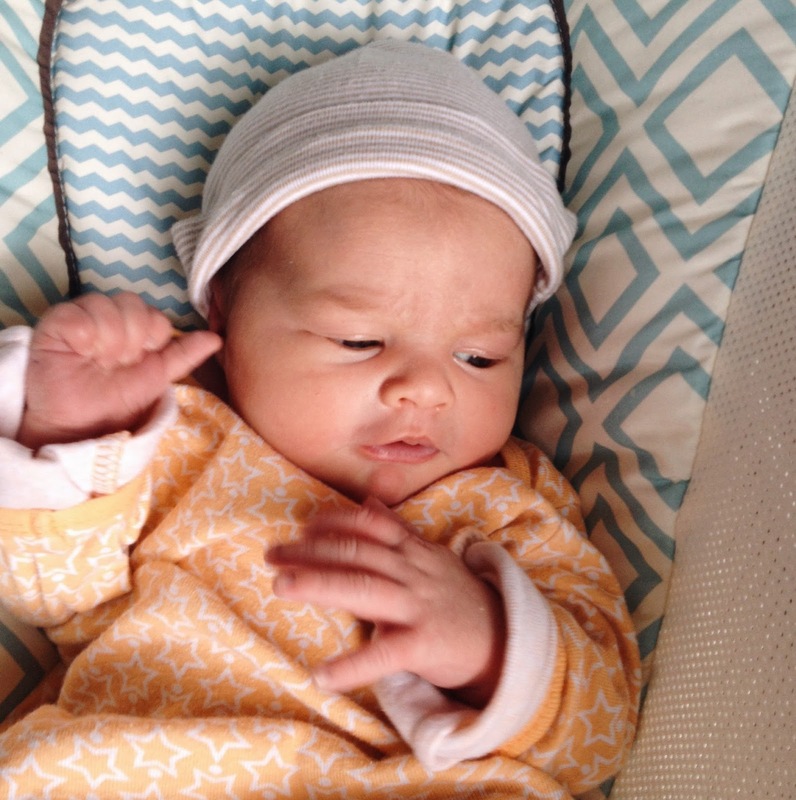 Anyway, August was our biggest baby at a healthy 8 pounds, 6 ounces and 21 inches. He was also six days late (though Nolan still takes the prize for longest pregnancy). The delivery was very smooth - I can detail it more later. He is now three weeks and four days old, and we are SO in love with our little August! This was the first photo I shared with friends and family. He does have some pretty juicy cheeks! This is one of my favorite photos from when Nolan and Ephraim came to visit in the hospital. 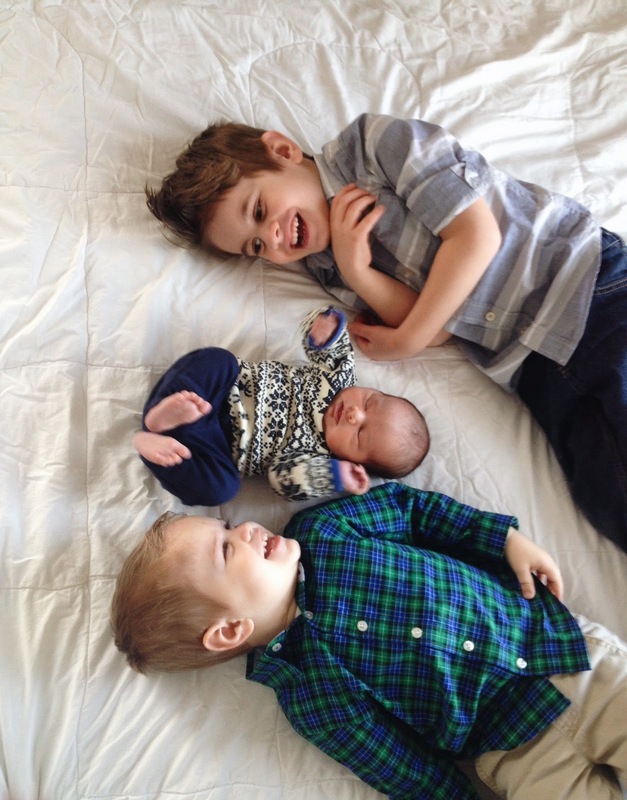 They were so excited to meet their brand new baby brother! Back at home, wearing his winter white on a snowy day. Proud daddy of three(!) boys! Sidenote, Steve is his parents' third out of four boys. Snuggling up in his bed. The nursing life . . . goodness, I missed it! Yes, it's sometimes hard to nurse on demand every two to three hours, but I love cuddling with my tiny little guy all day. My friend Erin dropped off this delicious drink and chocolate bar one day. We are so grateful for my MOPS friends and all of the meals we've received the past couple of weeks! Our friend Carol brought donuts one morning. Never underestimate the power of showing up! I love, love, love this photo of the three boys!! Every time we set him in the bassinet, he wakes up. We end up holding him all the time, which is okay with me, as he's only a newborn for such a short while. Cute little lion socks. Too bad socks don't stay on newborns' silky feet. This post-partum life has made me thirsty all the time! I can't get enough smoothies, hot chocolate, coffee and tea. This smoothie was the last of our strawberries from last summer. I bought a Magic Bullet and it's been so worth it! On Saturday, we celebrated Ephraim's third birthday with a trip to the donut shoppe. His face here was pure joy as we were singing to him. We will throw a party for him in a few days. I was happy to get in a photo with the birthday boy. Now that we have a newborn, all of a sudden, Ephraim is a giant and I can't believe he's already three! 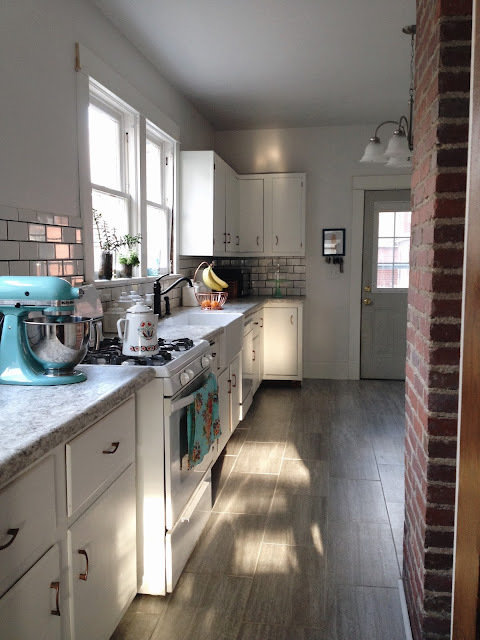 And I'll wrap up with a couple of pictures of our new kitchen. Steve finished it just in the nick of time before the baby was born. There are a couple of small jobs left to do, but it's totally functional now. We absolutely LOVE it! I'll hopefully post again soon with other photos from this past month! August is gorgeous (and the kitchen is too ;o)). Congratulations! May I ask what kind of bassinet you have? He is so cute!! So gorgeous and I LOVE your new kitchen. So pretty. He is so precious, Rachel! Congratulations on another healthy baby boy! Loving everything about this post!! So many congratulations :) And y'all look SO blissful!